California is more than just a place to visit, it’s a feeling that stays with you, and gently pulls you back for more. You see, while California is well known for its beauty, cultural diversity, theme parks, vibrant cities, and of course, Hollywood, this place of endless sun also comes with endless destinations for all ages. Put your feet up in Palm Springs. Looking for some tranquility? Look no further than the beautiful desert destination of Palm Springs. 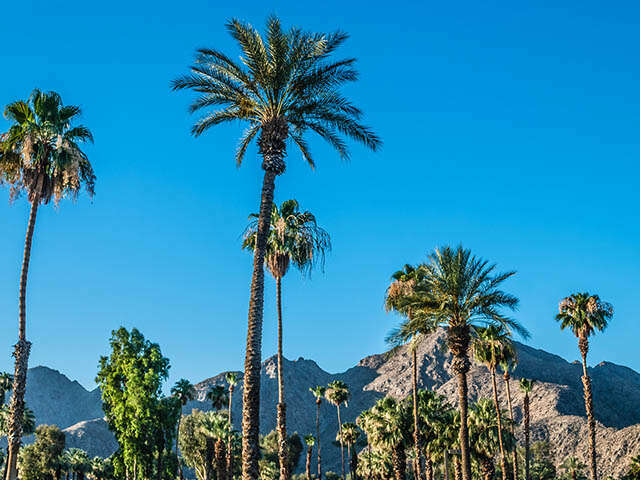 In its early days, it was commonly referred to as “Palm Valley,” until Judge John Guthrie McCallum officially named Palm Springs by listing it as the post office address in 1890. Located just two hours outside Los Angeles, you can rest assured you’ll be resting at countless spa and resorts in the area, many of them boasting majestic mountain views. And, it wouldn’t be a Palm Springs visit without some rounds of golf. Not a bad way to fill your day before an evening filled with five-star dining. If designer shopping is on your list, we suggest you visit nearby Palm Desert and El Paseo – an outdoor boulevard lined with top name stores, as well some of the region’s most inviting art galleries. Disneyland, championship golf, beaches and more. This is Orange County. From Disneyland Resort to over 68 kilometres of pristine beaches, and more than 40 championship golf courses, Orange County is definitely where you want to be. Located just one hour outside Los Angeles, this area is a sports lover’s dream as home to the NHL’s Anaheim Ducks, and MLB’s Los Angeles Angels of Anaheim. With so much to see and do, Orange County really is made for people of all ages. Plus, many celebrities call the area home. Perhaps you’ll even spot one as you find yourself checking out the multi-million dollar mansions in the area. Popular spots like Laguna Beach, Newport Beach and Huntington Beach are highly recommended. And, if you’re seeking out the surf life, you’re set, as the surrounding area is home to some of the best waves. For six decades, Disneyland Resort has been the place where dreams really do come true. Wish upon a star today, and let it take you to Southern California. San Diego. More than just pop culture. San Diego is where your dream of playing at the world famous Torrey Pines Golf Course can come true. The area also offers many more of North America’s top golf courses. Located just 32 km north of the Mexican border – and home to the world’s largest comic book and pop culture convention – San Diego offers more than just dreams of super-heroes. The area is filled with unique mountain ranges and valleys, attracting travellers from all over the world. If you’re looking for a little less trekking and more of a day for the kids, then check out the world-famous San Diego Zoo or the immensely popular Legoland California. If that’s not enough, then you’ll absolutely love Balboa Park, which has 15 museums to explore. Golden Gate Bridge from the North. Photo: Mirae Campbell. San Francisco. You may just leave your heart here. San Francisco, the city made even more famous by Tony Bennett’s ballad “I left my heart in San Francisco.” That classic song title has been adopted not just by the city and its residents, but by anyone who visits. The city and the area is not only at the centre of technological innovation, but it’s also home to the world’s most iconic fixtures: The Golden Gate Bridge, famous (or infamous) Alcatraz, and many professional sports teams. Here, you’ll also find many of the state’s most beautiful golf courses, and the wineries in and around the area are some of the most popular in North America. San Francisco is a business hub, but a highly popular leisure travel destination, bursting with culture and global cuisine. From Chinatown to Latin American Mission District, and everything in between, adventure awaits you in the city by the bay. Santa Monica Pier. Photo: Mirae Campbell. It’s time you discovered Los Angeles. Finally, it wouldn’t be a showcase on California without mentioning the second-largest city in the United States, Los Angeles. Some of the world’s best directors, actors and recording artists call L.A. home. You don’t have to look far to spot the iconic Hollywood sign – or someone famous. With its vibrant nightlife, 329 days of sunshine each year, and attractions and activities for just about anyone, Los Angeles offers the big break you’re looking for. Visit Muscle Beach and exercise outdoors alongside celebrity trainers, or spend the day exploring famous theme parks like Universal Studios Hollywood. There you have it. California: unlimited experiences are now boarding. You should go.